For decades competent and trained cyclists have had to deal with the occasional ignorant motorist who hollers out some variation on “Get off the damn road ya idjyit, yer gonna get yerself killed!” Fortunately most of these incidents don’t escalate into anything serious, and while little has been done to change this attitude over the years, we could shrug off such blather with confidence that the logic of our road use was supported both by direct personal experience and objective scientific study. We also had the backing of the League of American Bicyclists to defend our rights, if only in words. Fear of the overtaking motorist has been a key arguing point between those supporting separated facilities as the primary accommodation for bicyclists, and those who prefer bicyclists be treated as normal vehicle drivers. Last month the League released a report on bicyclist fatalities entitled Every Bicyclist Counts. A key finding noted by the League and other bicycle organizations is that 40% of bicyclist fatalities involved an overtaking motorist. This finding varies significantly from other studies and has caused quite a stir amidst bicycle advocates. The fear of the overtaking motorist has been a key arguing point between those supporting separated facilities as the primary accommodation for bicyclists, and those who prefer bicyclists be treated as normal vehicle drivers. Andy Clark: For the longest time it’s been an article of faith that we should be taking the lane, and that separated bike facilities are unnecessary … well, I think we are grown up enough now to say that’s not the case. Most people feel more comfortable actually having a paved shoulder or a cycle track or having a buffered or protected bike lane, and those things will reduce the fear and the incidence of being hit from behind. And we shouldn’t feel bad or awkward about saying that. BRAIN: So this data reinforces the movement toward separated facilities? AC: Yes, it reinforces and validates that approach. There is still a small, tiny percentage of people who think we should not be putting in that kind of infrastructure. They are hanging on to the idea that being hit from behind is not that big of a problem. Well, the data tends to suggest otherwise. There are still going to be places where there isn’t that kind of infrastructure and you are going to need to know how to cope with that. So we are not diminishing the need for the kind of education programs that we have presented and are going to continue to present. But we are saying that infrastructure can and should play a role in eliminating some of the most serious kinds of crashes. By undercutting the essential practice of lane control, Clarke is dismissing the key defensive driving strategy taught in the League’s own education program, not to mention that of every serious adult cyclist education program. With such a statement from the League, this 40% overtaking claim is highly significant for those of us who believe bicyclists are drivers of vehicles and wish to protect our rights to use regular roadway lanes. Lane control mitigates many motorist-caused crashes due to turning and crossing conflicts, as well as overtakings, the majority of which are sideswipes in which the motorist is well aware of the cyclist’s presence. By undercutting the essential practice of lane control, Clarke is dismissing the key defensive driving strategy taught in the League’s own education program, not to mention that of every serious adult cyclist education program. A thorough review of the League’s methodology and analysis is called for. The majority of the information captured by Every Bicyclist Counts came from newspaper reports (56% of all reported sources), TV reports (25%) and blogs (19%). Using news reports creates bias at two levels. First off, the types of stories that are most heavily reported are those involving the “good cyclist.” The person who is “just like us,” riding a well-maintained, good quality bike, wearing a helmet and obeying the rules. As one who has been following both media attention and official crash data for 20 years, I can tell you the story of the homeless alcoholic hit while crossing a dark arterial at night without lights or reflectors gets scant attention from the media compared to those “good cyclists.” As the League notes, their study misses about 24% of the crashes. It’s quite reasonable to expect that the characteristics of those missed fatalities vary significantly from those they reviewed. 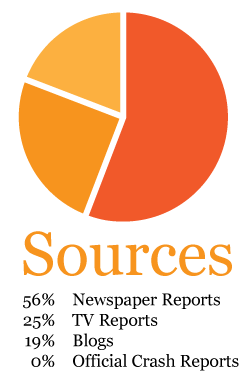 Next, the fact that the League’s sources are from the media rather than the official crash report means the facts have been filtered through a reporter, or a number of reporters. While we can certainly question the accuracy of official police reports in cycling crashes, we certainly aren’t getting more accurate information from the media, since they are themselves getting most of their information from law enforcement.Yes, an insightful analyst can spot inconsistencies or details that show flaws with the reporting, but that rarely tells us what actually happened, it only tells us what may not have happened. Media reports can only be less accurate than official crash reports, because reporters only report what they’ve been told by law enforcement. Approximately 40% of fatalities in our data with reported collision types were rear end collisions. This is higher than what was found in the 2010 FARS* release that included PBCAT-based crash types (27% of fatal crashes with reported collision types), although the crash type “motorist overtaking bicyclist” was the most common collision type in that data as well. Among the fatalities tracked by Every Bicyclist Counts, only 150 of the 633 reported fatalities included information on whether the cyclist was wearing a helmet. In the majority — 83 or 57% — of those fatalities the cyclist was wearing a helmet. This is higher than other data sources that record helmet use have reported. Again, this illustrates the bias in their event selection. Crashes involving “responsible cyclists” (sympathetic victims) are more likely to be counted than the ones involving intoxicated homeless persons. The League’s crash typology is nothing like the FHWA crash typing, and vagueness of some of the “types” leave many questions. Without a consistent typology it’s very difficult to compare results. For example “Cyclist side/car front” could mean a number of different crash types. It could mean either a cyclist being hit by a motorist who ran a red light or stop sign, or the opposite. The same goes for a “T-Hit.” Since free crash typing software is available from pedbikeinfo.org it’s a shame that they didn’t take advantage of it so we could compare it to other reports. “Sideswipe” is normally included in overtaking. The FHWA typing also includes “cyclist sudden swerve,” and “cyclist lost control” in the overtaking group. I cannot tell if cyclist sudden lefts or swerves are included in the overtakings. Motorist hits a bicyclist who is directly in front of him. Such crashes normally involve a night-time crash with a cyclist without lights or reflectors, or an exceptionally impaired motorist, either intoxicated or asleep. Motorist overestimates passing space and clips bicyclist. Motorist drifts into bicyclists (usually in shoulder or bike lane). May involve distraction; often occurs on bends or curves. 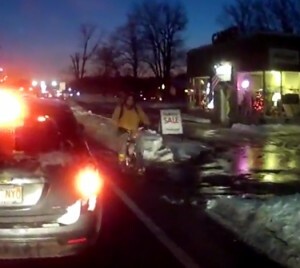 Bicyclist swerves into motorist’s path while attempting to avoid a suddenly-appearing hazard. While a direct hit from behind is what most people fear, that type only makes up a small portion of overtaking crashes. Each crash type has different causal mechanisms and different countermeasures. Lumping them together creates misleading message about the safety of bicycling—specifically, the ability of bicyclists to discourage or prevent motorists from hitting them. Their “unknowns” are exceptionally high, at 30%; probably because media reports tend to be quite sketchy. By comparison, for my review of cyclist fatalities from official crash reports, only 3% fell into the “unknown” category. These usually involved a cyclist found dead after a hit & run. Their categorization also includes “None,” which I presume to be a solo cyclist crash with no other vehicle involved. The League report’s 40% overtaking was arrived at by ignoring 41% of the crashes. Already we have 24% not reviewed at all, and another 23% of the remaining 76% set aside as “unknown.” So 41% of the fatalities during the study period were not categorized by the League. The 40% overtaking was arrived at by ignoring 41% of the crashes. The League’s overtaking percentage drops to 31% with the “unknowns” included, which is of course much closer to the 27% overtaking from FARS. In the League’s report we are shown that 31% of the crashes were on rural roads and 69% on urban roads (which includes suburban). But their data does not tell us what proportion of the rural or urban crashes involved overtaking. This matters because the League is arguing for separated urban bikeways based on that 40% number. 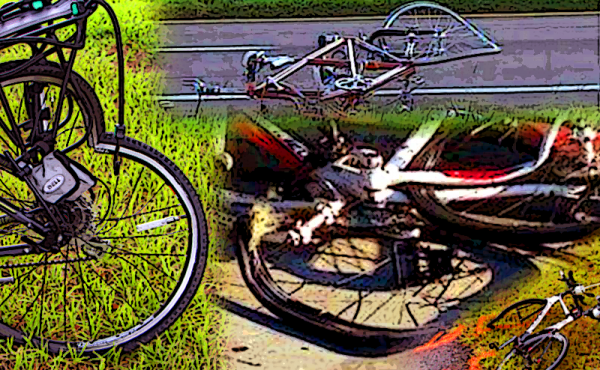 The State of North Carolina has provided a rich source of statewide bicyclist crash data online using official crash reports and the standard FHWA crash typing scheme. Using their online database I found that 34% of their fatals were overtakings, and 37% of all fatals were urban/suburban, but their online interface would not provide a cross-tabulation of rural/urban and crash type, so we cannot get a direct read on how many urban/suburban fatalities involved overtaking. We’ll have to estimate that from other factors. If one assumes that urban and rural overtakings are just as likely to result in a fatality, then 48 of their 129 fatal overtakings would have been urban, which works out to 12.7% of the 379 cyclist fatalities in their database. But rural and urban crashes are not equal in their severity. The NC data shows rural crashes were 3.6 times more likely to result in a fatality than urban crashes (4.7% versus 1.3%), so let’s divide those presumed 48 urban overtakings by the 3.6 times higher fatality potential of rural crashes. That gives us 13 urban overtakings, which is 9% of their 140 urban fatalities. While the League report paid legitimate attention to unsafe and illegal motorist behaviors that led to deaths, such as intoxication, distraction and leaving the scene, it’s also a sad fact that many bicyclist deaths involve cyclists behaving similarly. But the League report was strangely silent on this. In North Carolina’s data 19% of fatalities involved an intoxicated cyclist. In metro Orlando it was 40% overall, two of the nine rural overtakings, and three of the six suburban overtakings involved intoxicated cyclists. For the longest time it’s been an article of faith that we should be taking the lane, and that separated bike facilities are unnecessary … well, I think we are grown up enough now to say that’s not the case. Of the report’s five victim profiles, three involved cyclists in bike lanes or on paved shoulders; none were noted as using lane control in a general purpose lane. And yet their report did not give us any indication of how many lane-controlling cyclists had been hit from behind. Indeed, they didn’t even provide such an event among their five victim profiles. Of the five crashes, three involved cyclists in bike lanes or on paved shoulders; none were noted as using lane control in a general purpose lane. In the North Carolina data, we can see the differences between overtaking crashes (for all injury levels) in rural and urban areas. “Bicyclist Swerved” crashes are of course not relevant to lane control. “Misjudged Space” crashes are broadly understood to be remedied by lane control. “Undetected Cyclist” crashes mostly involve unlit cyclists at night. So it is the “Other/Unknown” that would most likely involve the totally distracted motorist who squarely hits the cyclist from behind. 7.5% of these “Other/Unknown” resulted in fatalities in North Carolina, but of course rural crashes are much more likely to result in fatalities than are urban ones. None of the 105 metro Orlando fatalities involved lane control. The real “article of faith” being presented here is that a practice promoted by the most experienced and highly trained cyclists in our culture is now being dismissed without evidence. The real “article of faith” being presented here is that a practice promoted by the most experienced and highly trained cyclists in our culture is now being dismissed without evidence. And it’s being dismissed by a national organization that was originally formed to promote safety and excellence in cycling. There is no question that we need better reporting of bicyclist crashes by law enforcement, but the League’s report only adds confusion, not clarity. We also should use more than just fatalities when making decisions about street design; adding incapacitating injuries will provide us with far more comprehensive data to combat the most serious crashes. And no, this review of the League’s fatality report is not intended as a blanket refusal of separated bicycle facilities. There are certainly some roads along which a sidepath would work. 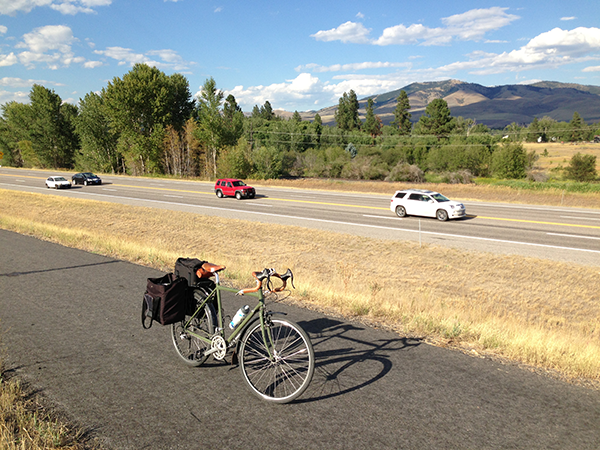 High-speed rural highways are good candidates. I used an excellent one in the Bitterroot Valley in Montana. Paths along riverfront and lakefront roads are workable as well. And certain suburban high-speed arterials may be suitable for sidepaths or bike lanes if they have limited and well-managed conflict points. 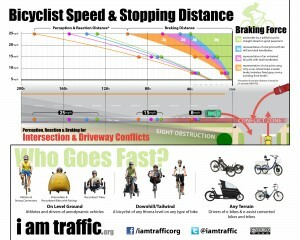 But when it comes to regular urban streets, overtaking is the least of our concerns as cyclists. That is where the turning and crossing conflicts are most common, where savvy, integrated cycling is essential, and where channelization of cyclists leads to unnecessary conflicts. Mighk Wilson is the president of the new American Bicycling Education Association. Education is not enough, and it takes ages to sink in. Have money, will sue; both individual drivers and County governments. Indeed. The profile of non-fatal crashes is so wildly different from that of fatals, and the numbers are so many times higher that considering only fatals is a distraction. Excellent, Mighk! 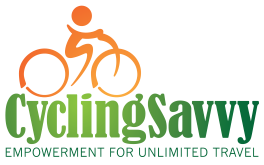 Thanks again for your professional, extremely competent support of bicycle driving. approaches are suggested for each problem type. It appears the theory for a cyclist to ride in the center of the travel lane to be better perceived by motorists …… is based on faith rather than data. The cyclist puts their safety in the hands of the motorist. These same motorists have about 5479 rear end collisions EACH DAY in the US …….. (and in about 1/2 of them never apply the brakes) in addition to about 10,959 other category crashes EACH DAY in the US according to the NHTSA based on police reports. Riding a bicycle in front of the trajectory of these motorists and depending on the motorist to avoid hitting the cyclist is a poor bet for the cyclist. 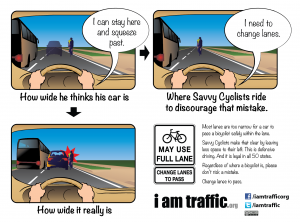 The paucity of data on motorists’/cyclists’ crashes that ride in the center of the travel lane of fast moving motorist traffic allows ‘VC’ or ‘Cycling Savvy’ advocates to tout the advantages of this behavior because so few cyclists practice it. In science one does not require another to prove something does not happen or exist, one requires another to prove it does, or that it does at a significant extent. If lane control is indeed a contributing factor in a significant percent of overtaking crashes the evidence should be there, and it’s the duty of those making that assertion to find it and share it. I should also add that bicycle drivers have long recognized than lane control mitigates a number of common motorist mistakes: right hooks, left crosses, drive-outs and sideswipes. If someone is going to discourage or prohibit cyclists from using lane control, they must definitively show that any detrimental aspects of lane control significantly outweigh the benefits. That’s what the League was attempting to do, but did so using bad data and faulty reasoning. Thanks for the thorough research and analysis, Mighk. – “…as well as overtakings, the majority of which are sideswipes in which the motorist is well aware of the cyclist’s presence.” What’s your source for this claim? – Is FARS just the FHWA dataset, or when you talk about FARS and FHWA categorizations are you talking about two different things? – Does FARS use the same crash types as PBCAT? – “Cyclist side/car front” and “T-hit” are League categories, not FWHA, correct? It seems obvious from context on a second reading, but it wasn’t immediately clear since you had just mentioned both. 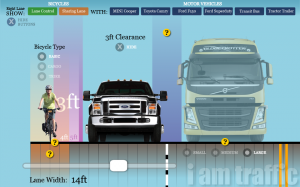 – Does the inset slideshow labeled “Overtaking crash types:” represent FHWA categorization or your own? – “‘Sideswipe’ is normally included in overtaking. The FHWA typing also includes…” Does the FHWA include the “sideswipe” category? – “Their ‘unknowns’ are exceptionally high…” Could you change “Their” to “The League’s”? – “By comparison, for my review …” I’m guessing this refers to your review of metro Orlando fatalities, but you mention it here before introducing it more specifically later on. Intentionally threatening a legally operating bicycle driver. Which in most states is also aggravated assault. License plate number 4EVP117, black sedan. Report to police. Reporting to the police is great, but not having something to report is better. The self-evidence of that shouldn’t even need explaining. The video was instructive in that a bad pass can be mitigated by a rightward movement (yes, the bicyclist moved rightward) that can’t occur when a bicyclist is at the right edge (no where to go bu to stick a pedal to the curb). Another point that the video nicely shows is that most motorists, I’d say the vast majority make lane changes to pass a cyclist centered, or left of center in a travel lane. 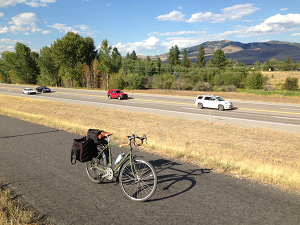 So the frequency of such bad passes is vastly lower when a bicyclist is not at the edge. Lane control prevents bad lawful movements, and greatly reduces the frequency of unlawful close passes. Here is a video showing center to left of center lane positioning results in lane change passes as the default passing behavior by motorists, leading to far fewer close passes. 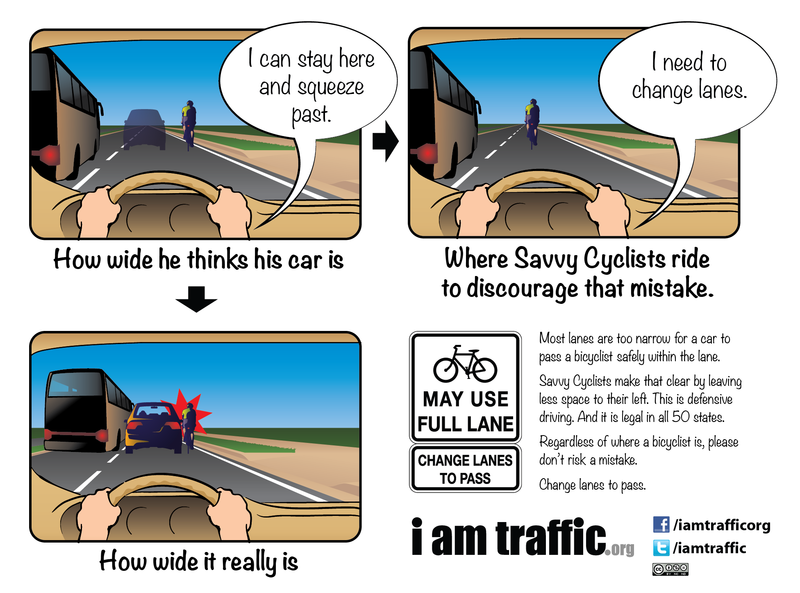 There’s a reason why bicycling traffic skills programs train cyclists to control lanes rather than edge ride. The difference is how motorists pass us. Do you want to be passed closely by nearly every driver in a travel lane, or do you want them to make lane changes? In addition, the article i wrote about bicyclist behavior for the i am traffic website also has a bearing on this discussion of driver behavior versus edge or ped behavior with respect to crash types, as Mighk noted above in his comment above about lane control mitigating common crossing crash types.